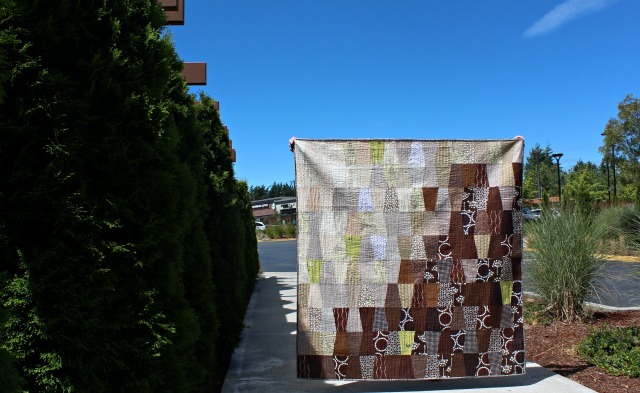 The honest truth is that way before I dug through the scrap basket and pulled out all my brown scraps, before I cut the first tumbler block, before I knew that my hope for the perfect photo-shoot would be dashed, this quilt had a name. A brown quilt had been on my list for quite a while, and when one day I got the inclination to make a scrappy tumbler quilt (you know, in my quest to lower the level of those scraps all the way to the bottom of the basket) the two ideas merged, and the name Double Tall Skinny Vanilla percolated up and did not go away. And when that happened, I got the notion that the photo-shoot just had to be at one of my neighborhood Starbucks, preferable with a barista showing the quilt off through the drive-through window. I even considered a few different store locations, and picked the one with the best-looking siding as a backdrop. Only problem was, Starbucks didn't like my idea as much as I did. snif. So I settled for the parking lot, strange as that may be. Some days it's worth settling when blue sky and nicely planted community areas are involved, right? In case you missed it, I posted a tutorial for scrappy tumblers earlier in the month. They are really easy to cut once you know what size you want. And they piece together so quickly and neatly. I chose to lay out my tumblers in a gradient of sorts, letting one lone 'cup' stand out and receive some singular quilting. I found several brown and green prints in the scrap basket, and I thought they added a fun nod to my favorite espresso stand's signature color. Two coffee-colored threads were used for quilting - Aurifil 50wt #2372 (Dark Antique Gold) for the cup, in an angular spiral; and the remainder a steam-symbolic wavy straight-line in #2326 (Sand). Using stash browns and greens, I pieced a back - not my favorite thing to do but I used up more fabric! And I chose a binding that is kind of striking and keeps your eye moving, a yummy brown wonky grid from Echo by Lotta Jansdotter. 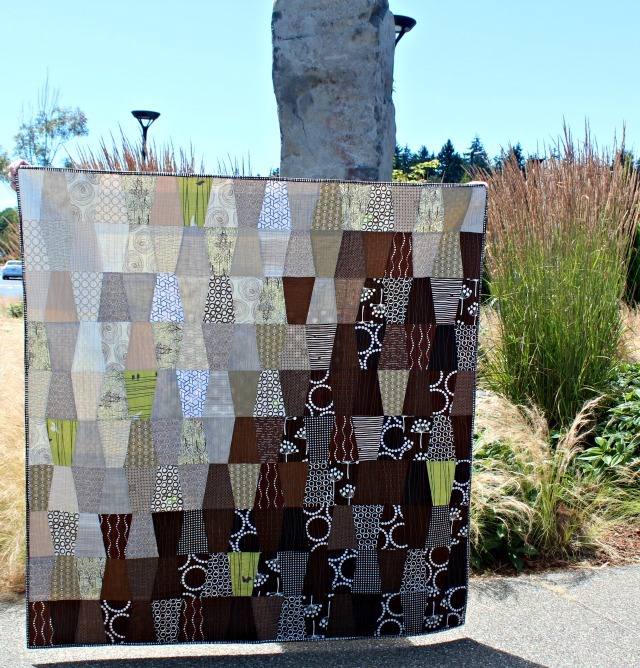 So things didn't turn out quite like I'd hoped as far as the photo-shoot went, but otherwise, I'm more than pleased that I finally made a brown quilt, and having been inspired by my favorite espresso beverage kept me pretty stoked to work on it. AND, the fact that this is my sixth scrappy quilt this year was a bonus. Bottom's up! 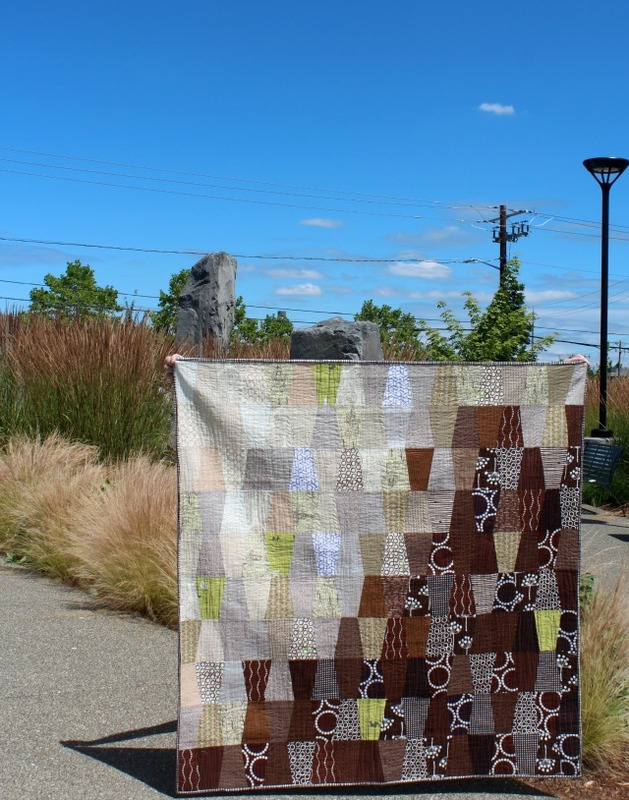 This quilt was on my 2017 Q3 Finish-A-Long list! Fabulous quilt, Debbie. Love the one lone brown cup and the quilting. Just fantastic!!! Congratulations! Clever you, Debbie! Who'd have thought browns could turn out so stunningly?! Lovely quilt. Can't believe you've held on to that Echo print, great for the binding. Great quilt! You gave me some ideas for using my tumbler die. I've made a couple of tumbler quilts but I like your more contemporary design. I really, really like this. 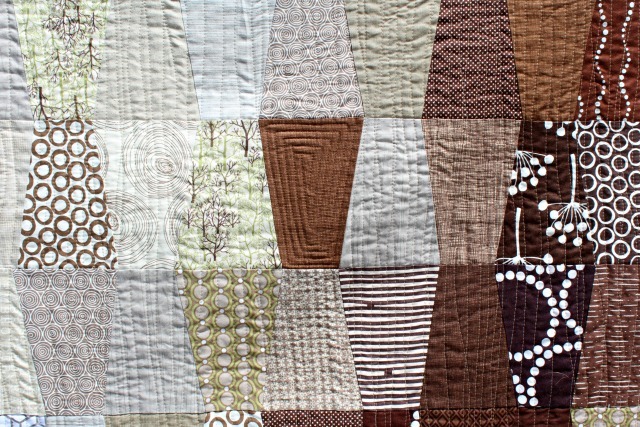 I'm not a coffee drinker myself, but it is totally a coffee quilt! And the hints of green do make me think of Starbucks. I also really like the back. I think the green and browns go really well together. I think the photo shoot turned out really well, but I can certainly understand the disappointment of not having your full vision realized. Great name!! It is a lovely quilt, and the pictures turned out gorgeous, despite the fact that they weren't as planned. 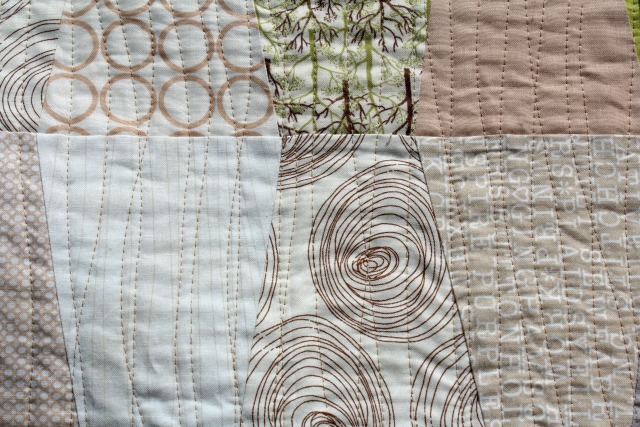 Your quilt and your photos are lovely, even though they weren't what you had envisioned. I'm thinking you could find a quaint, locally owned espresso stand that would love to work with you for a photo shoot. So happy to be enjoying a cuppa as I read this! The quilt is charming, and I love the yummy colors! My quilt guild just purchased a large tumbler die for our Accuquilt cutter. It's great to see what can become of a quilt using this shape! Love it! Thats a great quilt and a big loss for starbucks, they could have had your pretty quilt as an outstanding sorce of advertising and they declined. I like the pictures you took near the big bushes of grass, it looks very nice there, and the tumblers actually look like coffee cups to me. Debbie you turned out yet another beautiful quilt. Proof that brown is totally under-rated! You are so clever with the cup in the middle with steamy-wavy lines. I also love your resourceful easy cutting without having to purchase a special ruler. Thank you for another beautiful inspiration! I am totally surprised at Starbucks! It would have been good advertisement for them - now, not so much! I don't just jump for joy at the thought of piecing a backing but when I do (and it's over and I've used fabric from my stash), I'm inordinately proud of myself. Great finish for you. Love the color changes and the addition of the greens. Curious as to how you had that many browns -- I might have four pieces total! Ha! And the name -- absolutely PERFECT! It turned out lovely! Even now Starbucks has free advertising! So, so lovely - front and back. Love how the light goes into the dark on the front tumbler pattern. Very stunning! I absolutely love this quilt! Your fabric choices for the front are wonderful, and use of GREEN on the back is perfect!! 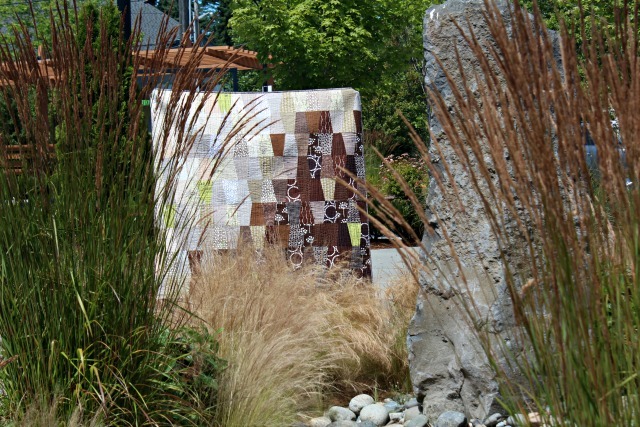 The fact that this quilt was made of scraps...perfect! Love the tumbler shape and especially happy you shared the tutorial! Now I could actually cut and make one! Photo shoot. Things don't always go as planned! I actually like the last picture the best. Its almost like a secret shoot! Awesome finish! I love the design and the quilt name. Love this quilt and the design is great. Not a fan of Starbucks at all, but sure love this quilt. I love the pops of green! And boo on Starbucks. I'd just take it to my local coffee shack, they'd be more willing! Great use of your tumblers. The gradient layout is wonderful. I really enjoyed what you ended up with for photoshoot backdrops. Your blog is always an inspiration. I love the quilt and fabrics you used, and of course the quilting in which you wrote a wonderful tutorial on how to do wavy quilting which I've used and my quilt turned out great thanks to you but what I really love is your statement about piecing a back--not your favorite thing to do--I thought I was the only one that felt this way. To me, it's like making another quilt and I really prefer to use one fabric even though I have enough stash to make a q-zillion backs. Thanks for always being an inspiration! BTW, love the side story about the photo shoot. Love this quilt! Really reminds of caffe latte, cappuccino, black coffee and green tea! And this binding! I have loads of that fabric too, I think I have to copy that! Their loss for sure! Love the touches of green. 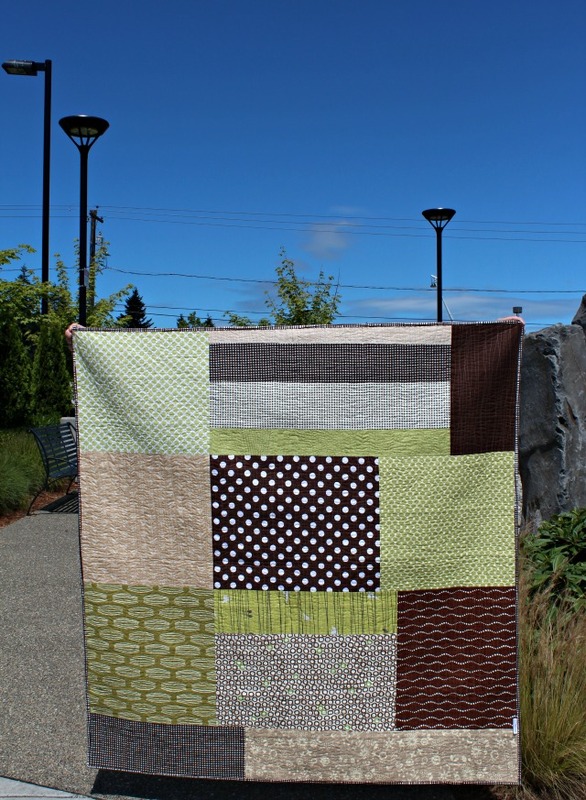 What a great scrap quilt and perfect name! Headed over for your tutorial now! Great way to use up some fabric! It does make me want another cup of coffee right now haha. Love those pops of green in there, too. Amazing finish... once again! I just love the name too. You are really inspiring me to use up more of my scraps. 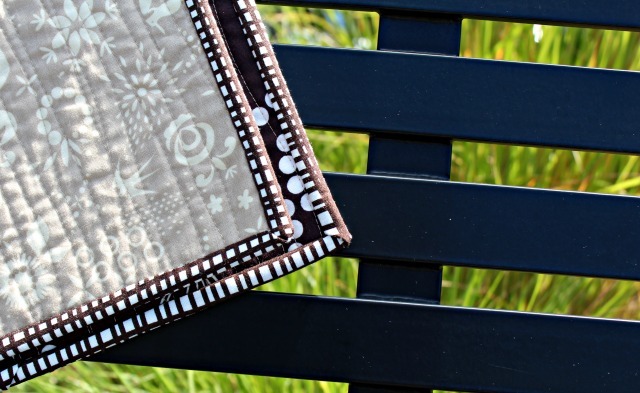 Who knew you could make such a gorgeous quilt using just scraps!! Perfect name for this brown quilt. It's funny that the name came first. Brown doesn't make much of an appearance in my stash so it's nice to see it used so well. Just awesome as per usual! Making a cup right after this comment!! I'm back on behalf of the FAL Hosts! Thank you so much for playing along - your work is so inspiring!